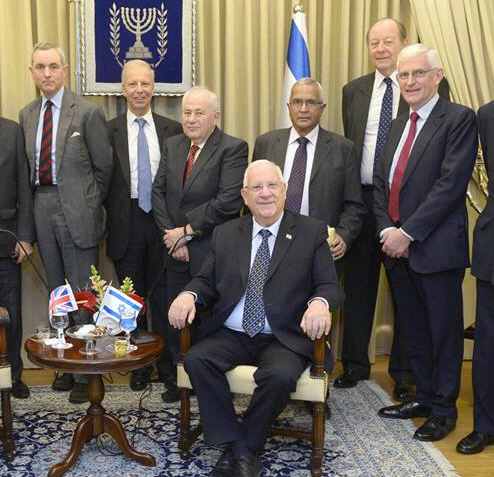 Just back from the first UK all party Peers visit to Israel and West Bank. There were eleven of us, 5 Tories, 2 Labour, one Cross bencher (the admirable Field Marshall Lord Guthrie), and three Liberal Democrats (Lords Dholakia, Stoneham & Palmer). It was a very full action packed five days. Highlights included a meeting with Prime Minister Netanyahu; a meeting with President Rivlin (who despite being a Likud MK was a strong supporter of minority rights). We went to Ramallah to lunch with Palestinians Nabil Shaath (PLO Senior Negotiator in Peace Process) and Issa Kassissieh Ambassador to the Vatican. We met Dr Khalil Shikaki a pollster and Professor of Political Science. We also visited the incredible new Palestinian town of Rawabi in the West Bank. I must say our meeting with the PA men and their team was profoundly disappointing to the extent that Mr Shaath ended by blaming the British for the lack of a Palestinian State, ignoring completely the fact that prior to 1967 it was well within the powers of Jordan and Egypt, who respectively controlled the West Bank and Gaza, to have created a State of Palestine at a time when there were no Israeli Settlers in those areas. It was fascinating meeting Professor Asa Kasher who spoke to us about military ethics and told our Field Marshall Guthrie that his book was required reading by Israeli military and academics. Charles Guthrie has promised to send me a copy of his book. We met with the new Ambassador to Israel, David Quarrey, plus recently departed Israeli Ambassador to London Daniel Taub. We also met the Ambassador Designate to UK Mark Regev who said he will take up post in UK ‘soon’. This is a guy very close to PM Netanyahu and an accomplished diplomat. We paid a visit to the Supreme Court and met with Justice Elyakim Ruinstein and other Judges. It was interesting to see at first hand this aspect of Israeli democracy. •	Itmar Marcus of Palestine Media Watch who gave a frightening presentation on the radicalisation of Palestinian youth in the schools and in sport. It must say something when Palestinian sporting events are named after ‘Martyrs’ who killed Israelis. •	Alon Ushpiz Political Director of Ministry of Foreign Affairs who gave a masterly and well informed presentation on the Israeli scene and chances for progress to peace. We asked searching questions including mine on why Israeli Public Relations is so poor at quickly explaining and reacting to news stories. His response was that they ‘needed to do better’. But it was not all just meetings. We visited the town of Sderot and the Moshav Netiv Ha’asara right on the border with Gaza. They live in and out of bomb shelters which has saved lives but caused great trauma particularly for the kids who know of no life without shelters and safe rooms at home and in school. Finally we visited Yad Vashem Holocaust Memorial which is always very moving especially to the likes of me who lost a grandparent in Poland. There was much more than I have summarised above. My overall feeling today is of exhaustion but I know that the eleven Peers are much more informed than a week ago.